Product #18112 | SKU LG-EL22-GRYBLK | 0.0 (no ratings yet) Thanks for your rating! 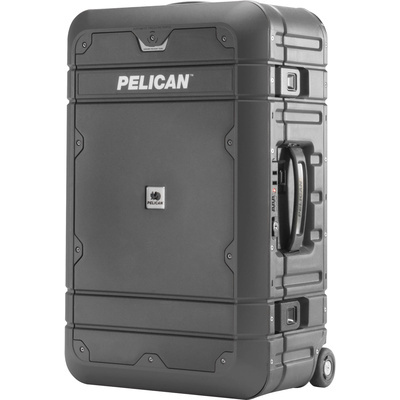 Travellers in need of a strong, dependable, and attractive way to carry their belongings will appreciate the gray and black EL22 Elite Carry-On Luggage from Pelican . This FAA-approved carry-on luggage case is made of lightweight injection moulded HPX high performance resin - polypropylene and polycarbonate. It features Valox latches, TSA approved combination lock, a self-regulating vent, stainless-steel hinge pins, and a fabric interior. Carry your Elite with the top handle, side handle, or retractable trolley handle. Built-in wheels with ball bearings make travelling over level ground fast and easy. The Elite has passed submergence tests for one hour at a depth of one metre, and free-fall impact tests with up to 11.33 kg of weight. For air travel, the Elite meets airline carry-on regulations of less than 1.1 m.
Included with your Elite Luggage - 1 detachable lid organiser, 1 Dopp style toiletry kit, and 1 zippered shoe sack.